A collection of games rendered in beautiful ASCII. A single-player MOBA, rendered in beautiful ASCII. Help the blue monsters destroy the red monsters’ magic crystals. Made during a Game-In-A-Day at Xero. The Irrefutable Church of Glorious Klob, God of Gods and Also Everything Else, reigns supreme in the great city! Go forth, Fabulous Supreme General Ibo, and slay those who remain loyal to the dead king! An experimental ASCII wargame where battles are resolved in choose-your-own-adventure form (probably). 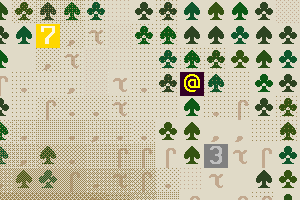 It will form the basis of future projects, and be used to play-test a combat minigame.